LOL that was going to be my guess, came to me as I went to sleep last night. Guess we loose again! 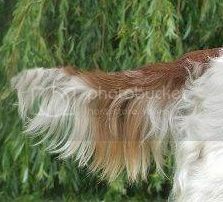 Springer Spaniel?? Looks reasonable tall in the hind quarters. 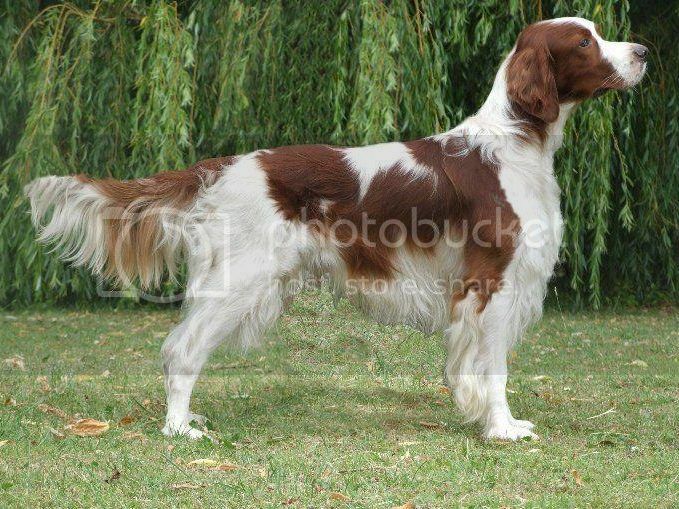 Irish red and white setter? Yey! Gorgeous dogs aren't they?! White (at least the bit we can see), possibly shortish legs, feathers and fluffy toes. They sure are and LOL I'm kicking myself for not getting it, as one of Leaf's good friends at Doggy School was a Red Irish Setter! But apparently when young have, according to Niamh's owner, the attention span of a goldfish or less! Yes, Welsh Springer Spaniels are shorter but if you look closely you can see a little 'blue freckle' kinda look and I don't think Welsh Springers have any blue in them. I'm going to say English Blue Roan Cocker Spaniel. Kinda reminds me of one I had when I was 2 years old. Barking up the wrong tree, guys!